NIU geology major Brian Guthrie in Antarctica. 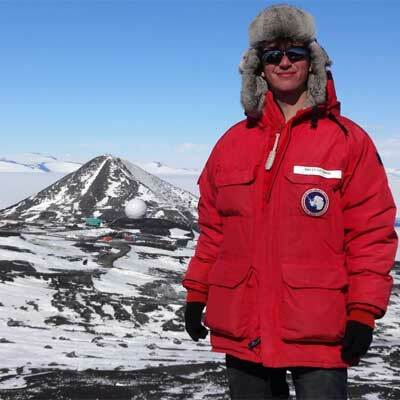 Brian Guthrie, a senior NIU geology major, says his recent experience in the Antarctic as part of a major research team was, well, out of this world. The icy desert continent “was like nothing I’d ever seen before,” says the 23-year-old St. Charles native, who spent more than a month in Antarctica. At one point, he took advantage of some free time to climb along a trail from McMurdo Station, a U.S. research base that resembles an old frontier town, to a spot atop nearby Observation Hill. From its 700-foot summit, Guthrie drank in the beauty. 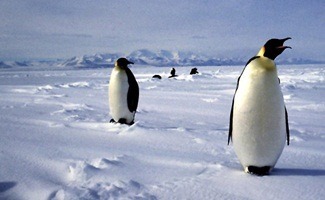 From one vantage point, he looked out on a pure white landscape; from another, the ocean licked at the ice-shelf edge. In another direction, the skyline held mountain peaks; and from yet another perspective, Guthrie could look down upon McMurdo. Guthrie is the youngest member of a team of researchers from NIU who returned to campus in February after working on a project that made headlines worldwide. 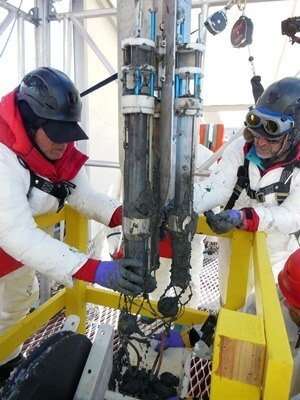 The National Science Foundation provided $10 million in support of the scientific endeavor, known as WISSARD, for Whillans Ice Stream Subglacial Access Research Drilling. In addition to the NIU contingent, colleagues and students from nine other major universities were involved, along with outside engineers and technicians. The aim was to gain access to Subglacial Lake Whillans by drilling through a half-mile of ice. NIU team members began to arrive as early as November, at the start of the Antarctic summer, when the sun never sets and temperatures hover just below freezing (balmy by South Pole standards). Over a 12-day stretch in January, an operations team manned a convoy of giant Caterpillar and Challenger tractors that pulled sleds carrying large steel shipping containers laden with high-tech instruments. The convoy traveled about 600 miles across the Ross Ice Shelf, setting up camp at a drill site on the ice above Subglacial Lake Whillans. Scientists were flown into the “deep field” site, where the shipping containers were used as work offices and data centers. Small yellow tents, illuminated by round-the-clock sun, served as sleeping quarters. Powell and Scherer recover sediment cores. Using a custom-designed hot water drill, the WISSARD team penetrated the lake beneath the ice Jan. 29. Soon after, scientists retrieved the first ever clean whole samples from an Antarctic subglacial lake. Breaching the lake made science news headlines, but a more intriguing story was yet to come. The scientists discovered bacterial life living in the cold, dark and inhospitable water underneath the West Antarctic Ice Sheet, a find of interest to researchers studying how life forms might exist on other planets. NIU’s Ross Powell, a Board of Trustees Professor of geology, was one of three leaders of WISSARD. “The WISSARD project required years of preparation,” Powell says. 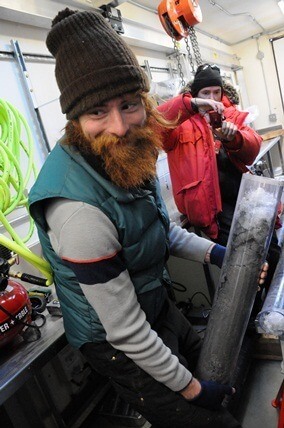 NIU Ph.D. student Timothy Hodson holds a core from the subglacial lake. Because the Antarctic is such an extreme environment, the continent is of keen interest to scientists who study climate change. At the poles, changes in climate are magnified. So studying the continent’s climate history, including the behavior of its massive ice sheet during ancient cold and warm periods, will help modelers predict what the future might hold for our warming planet. Part of an elaborate system of streams and lakes beneath the ice, Subglacial Lake Whillans fills with water and then drains every five to 10 years. Scientists want to learn more about the sub-ice environment to better understand past and future glacial dynamics. “We hope sediment cores recovered from the lakebed will begin to give us information on the behavior of the ice sheet in that region over time,” Powell explains. At the point of borehole entry, the researchers were surprised to find the lake was shallow – about 3 feet to 5 feet deep. But WISSARD scientists confirmed there were viable, or living, bacterial cells in both the lake water and the sediment, Powell says. Since the bacteria live in the dark, the micro-organisms must get their energy from some method other than photosynthesis. NIU computer science research associate John Winans provided technical support to the project. 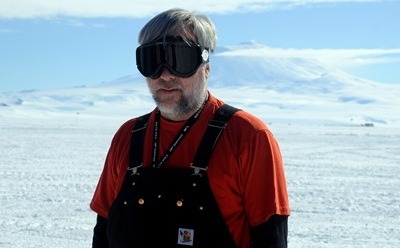 For Powell, this was his 14th research trip to “the ice,” and it was the sixth trip for Scherer. For other members of the NIU contingent, however, it was a new adventure. Ph.D. student Timothy Hodson was in the Antarctic from Nov. 5 through Feb. 9, and he won’t soon forget the icy white landscape that often blended seamlessly into a milky, cloud-covered sky. “You’re working seven days a week and the sun never sets. It’s like falling into a time warp,” says Hodson, who is involved with the sediment research and served as a software and instrumentation technician while in the field in Antarctica. There’s also a keen sense of community among the researchers, engineers and operations workers who take up residence in the dormitories of McMurdo. “I loved the entire experience,” says John Winans, an NIU computer science research associate. He spent about six weeks before Christmas in the Antarctic, refining software for data collection and providing other technical support for WISSARD. Guthrie, NIU’s undergraduate researcher, arrived in the Antarctic in early January and later spent several days in the deep field, where he prepped instruments, operated a winch and bagged and processed field samples. He hopes polar science continues to be in his future. Professors Scherer and Powell, NIU’s polar veterans, say they are hopeful that the WISSARD project will be funded for another drilling season late this year.